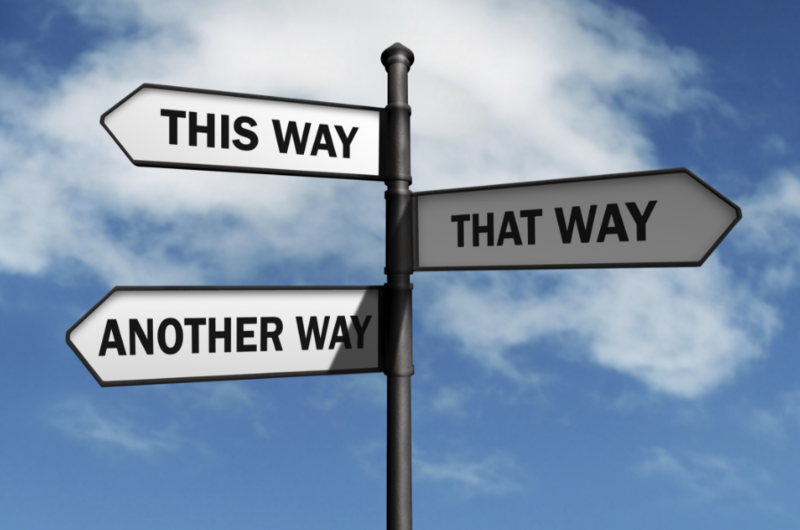 In our personal lives, we often find ourselves at wide variety of crossroads. Even with a relatively clear goal, we may have many choices as to how to proceed: which toy to pick (as a child), which career to choose (as a young adult), whom to spend the rest of our life with (as an adult), which cruise to take next (as a retiree), who should write the eulogy (when on death bed)… These are just a few of perhaps thousands of occasions in our life span when we are required to make a substantial choice. Thus, “which is option is the best” is a natural question, and “it depends…” is then the most common rhetorical start of an answer. Businesses, as they journey through their lives, are also often at crossroads. Changes in the business environment, both internal and external, force them to make changes in the way they conduct themselves in order to remain relevant and competitive in their respective markets. Current digital era has presented one such moment in the lives of many businesses, especially the existing ones, where they much choose how to proceed with digital transformation. To them, we say, choose “cloud”, the strategy and practice of sourcing technical capabilities across the Internet, as a primary enabler. If you are interested in what we base such a cloud-friendly statement on, then please continue reading. An interesting set of survey results (see above figures) presented in the 2015 Digital Vortex report by The Global Center for Digital Business Transformation, a joint initiative of IMD and CISCO, provides a good context for the rest of the discussion. The digital business environment is full of disruptive “shocks”. Often, as if out-of-the-blue, some vendor, with its innovative products or services offers and delivery mechanisms, changes the prevailing game almost overnight. Incumbents, even the established brands of the pre-digital era, have much to lose from such disruption unless they have strong enough digital transformation strategies of their own. 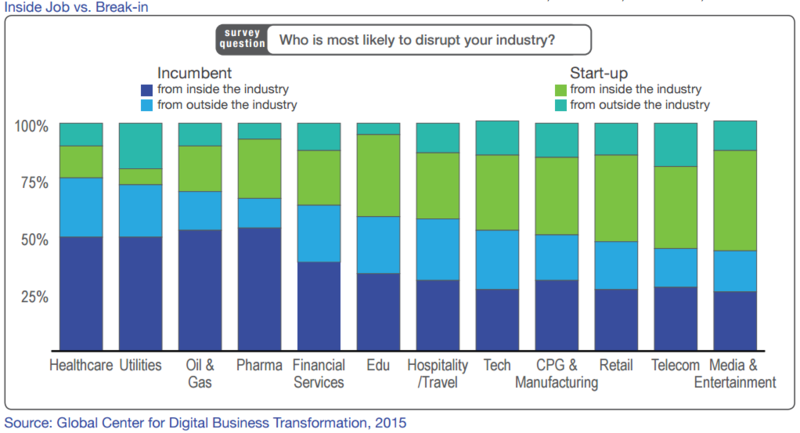 While the degree of concern varies from industry to industry, as seen in the left figure, disruption from digital start-ups is a key threat to incumbent businesses. Where do the start-ups get such power to scare the large and established incumbents? Refer to the right figure for some clues. 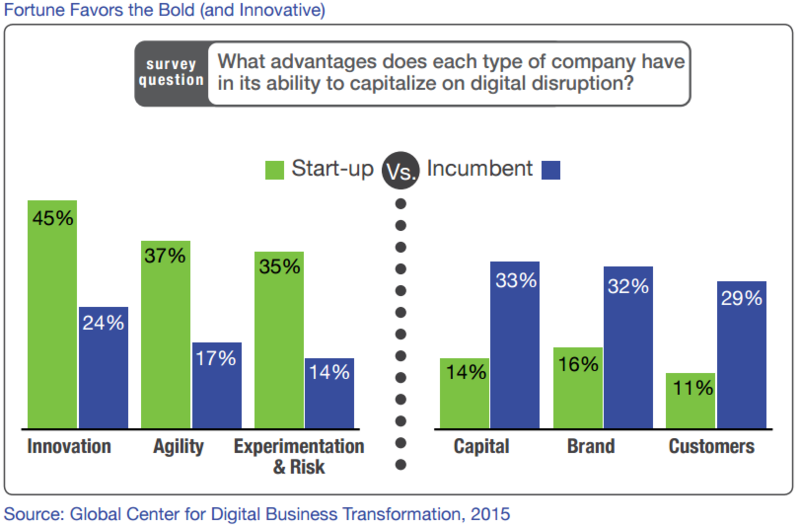 Generally speaking, compared to incumbents, start-ups are more agile. They act faster, innovate better, and are not afraid to fail at what they consider to be exciting innovation and product or service launch experiments. These differentiating characteristics form a critical part of the winning recipe of start-ups in spite of incumbents having more investment power and customer-recognized brand presence. Can cloud computing help these incumbents challenge start-ups? The answer, of course, is yes, as you might have already guessed from the title of the article. Let’s then see how cloud could indeed be helpful in this context. Speed of action is one of the most important attributes of successful digital businesses. Today most software-related technical resources including COTS applications (SaaS), application building platforms (PaaS), infrastructure components like computing hardware, storage capacity and network connectivity (IaaS), are readily available in the Cloud, just a few clicks away from being utilized as commodity “services”. Take, for example, the case of setting up (aka provisioning) “environments”. In order to develop and test technology products as well as run them in production or in training modes companies need a complex set of technical tools and assets made up of software and hardware – this set is the “environment”. Using traditional methods, and depending on the operating procedures of a company, provisioning of a complex environment can take from days, to-weeks, to-months; in cloud, environments like this can be created in minutes! One also has instant access to thousands of software applications that provide similar features like traditional “system-of-record” on-premise applications (such as ERP, CRM, HCM, MRP, Financials, BI, etc.) and often using much simpler interfaces as well as offering newer digital capabilities like advanced mobile application platforms, “big data” handling, real-time analytics, AI, device-to-device communication (IoT), machine-learning, cognitive computing, etc. A good question to ask at this point is “what about the cost of such cloud services”. Since cloud services are commonly offered as pay-as-you-use, even complex technology experiments can be done using funds typically within the discretionary budget limits of most stakeholders. During a scale-out, Cloud deployments of the production versions of successful innovation outcomes are also often cheaper than traditional data-center options. This combination of the cloud-enabled ability to experiment with concepts or to create products or services faster and cheaper lowers the barriers for large incumbents to play the digital game with the similar agility and creativity as start-ups. When they are able to master the capabilities of being sufficiently agile and creative, incumbents can then leverage their core assets of capital, brand image and customer base to overtake start-ups who, for scaling up their own initial successes, need these assets that they must find ways to gather. It turns out that there are already many suitable ways to modernize traditional technical assets using cloud-based tools and technologies! So, if you are on a journey to digital excellence why wouldn’t you choose a “cloud first” strategy? By the way, ever wonder where do those disruptors like Netflix, Airbnb and Etsy source their technical capabilities from?